With the growing popularity of our Fink Tank Football System, over recent weeks I have been fielding a few questions on just how it (and many other tipsters and systems) actually make money betting. So I thought today would provide a great opportunity to explain the concept of ‘value betting’ a little bit more and just how shrewd punters get one over the bookies regularly by using it. ” Hi, I am a little confused as to your system and perhaps you could please clarify a point. In your example of Arsenal v Norwich you refer to an away win by Norwich at odds of 8.0, and to back it with Totesport having the best odds. Why This Free Tipster Demands Your Attention! It’s a common myth that when it comes to finding winning betting tips you need to spend a fortune to get hold of them. Because if you know where to look, it is easy to find some fantastic free and budget tipsters that can help you get started winning without breaking the bank. In fact, as our independent proofing shows, many of them continue to make sums of money betting that put many expensive tipsters in the shade…So if you think you need to spend thousands of pounds in subscription fees for a good tipster…think again! A great example of a profitable free tipster comes in the form of one long running SBC-recommended service, who has been flying this October. His results of late have been up there with the very best! Is This Man The Best Performing Racing Tipster? Latest SBC Mag Reveals All! 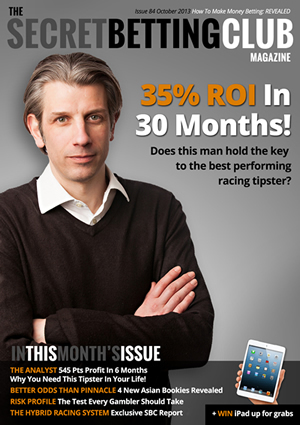 The very latest Smart Betting Club magazine is out now and is an absolute must-read for those of you keen to find more on what makes money betting. The 4 ‘Asian’ Bookmakers offering better odds than Pinnacle for football betting. Exclusive SBC feature. Your Betting Risk Profile – The test EVERY gambler should take. Exclusive report on the Hybrid Racing System. Win in the SBC Competition – An iPad Mini is up for grabs! That’s not all though because as an SBC member you will also gain access to their huge 7+ year back catalogue full of tipster reviews, expert interviews and guides, betting systems and profitable betting advice. One of the most important things you can ever do to help your betting profits, is to make sure you always, always get the very best odds that you can take on any bet placed. It’s one reason that over the past year I have been highlighting what I call the ‘football odds conspiracy‘ that costs so many punters (and something the betting industry consistently turns a blind eye to). As that article outlines, the simple act of placing your football bets with a bookie such as Pinnacle Sports could increase your odds by as much as 25%.